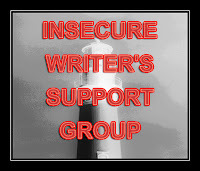 Today, the first Wednesday, is Insecure Writer's Day courtesy CAPT Alex and the wild bunch. You can find the whole group of us here. I encourage you to make the rounds and see the talented group of writers slaving away with a fistful of pens and a steaming mug of insecurity. So, the essay today regards we insecure writers who are surrounded with the ordinary. It's a work-a-day life with spouse, kids, job, pets, a mortgage (or not). Tonight I had the first mow of the season. Mundane, right? Here we have tonight's recommendation: One Day In The Life Of Ivan Denisovich. Sure, it was early cold war and the gulag was still going strong. You should read it for more than its historical context. 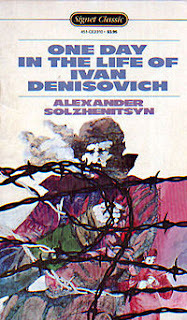 In 1970, Solzhenitsyn won the Nobel ... in Literature. It wasn't a Peace Prize. They give those things out like candy. This was in lit. He earned it through every syllable, too. The title is the story. The fellow referenced (The name on the book is the patronymic. This is the "old style" Slavic name) is Shukhov and once you meet him, you'll never forget him. He's not a spy or a freedom fighter or a member of the west-sponsored resistance. He's a Joe, an everyman. The story is of Shukhov's normal day in an uncomfortable place doing uncomfortable things. He wakes up feeling ill, though he has to go to work. He can't get in to see the doctor because he's a slow starter and so doesn't get a note. He has to show up at a job he doesn't like and work with people he doesn't love. Why? He needs a paycheck, just like you. His comes as food but you're not eating Lincolns on rye bread, either. The story seems exceptional because we're immersed in the fellow's day. We feel what he feels. We see what he sees. In the end when he's reflecting on his day, we feel the same way. He had many fortunate breaks that day. I'm droning on because for Solzhenitsyn, there was a meaningful political context in which to tell the tale of an ordinary Joe. We, in his time, would have a very similar day. The piece that compels us through the story isn't the Soviet oppressor. The thing that compels us is the human condition, Shukhov's place in it, and his interaction with other people. Your story of today - just today - would be as compelling if you immerse us in your environment, if you allow us to understand your social and political context, if you allow us to see your emotional interaction with other people many of whom you did not choose to be beside. The ordinary is not ordinary when you tell the story. A man getting his mail at the end of the day while his neighbor from across the street stands in the front yard and glares at him can be enough. Let me see it through the character's eyes and feel what he feels, know what he knows. If I identify with him, that immersion of pulling the bills from the box and feeling their physical weight in his hand will be enough. Drag me back to the house. Let me pull his ball and chain. I can take it. I've read Ivan. You should read Ivan, too. It'll make you a little less insecure. It will make your ordinary seem less so. Never read that book, but you make a compelling case, so I'll look it up at our library. Sounds very intriguing. Sometimes, all we need is to just relate. Thanks for sharing! 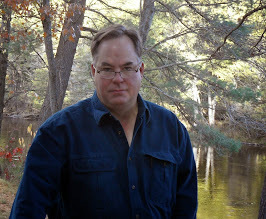 Mark - thanks for coming by ... and for co-hosting! C - I have a protagonist who wants a tattoo so she can be a unique individualist ... just like all her friends. Debra, welcome. Taking out the trash can be an interesting story. It's of course more interesting if there's a dead gangster in the can; but, that's another story.